The Houston Rockets will face a hard cap in 2015-16. David Weiner breaks down the impact of the Montrezl Harrell signing and where the team goes from here. 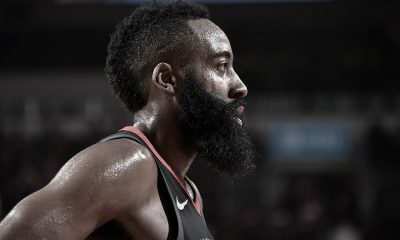 With the recent signing of Montrezl Harrell to a three-year, $3.1 million deal using a portion of the Non-Taxpayer Mid-Level Exception (MLE), the Houston Rockets finally answered a key question many have been asking over the past two months, ever since they agreed to a three-year, $10 million deal with K.J. McDaniels using a significant portion of the MLE. That question: Are the Rockets willing to subject themselves to a hard cap at the “apron” level ($88.74 million) by using the Non-Taxpayer MLE? The Rockets now sit approximately $1.56 million below the apron level. I addressed many of the factors surrounding Harrell’s situation in my last cap update. Take a look at that piece for more context. 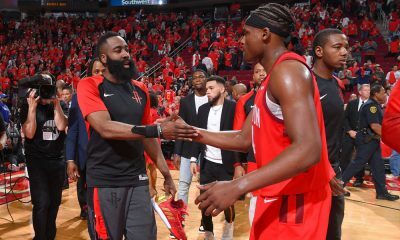 This article will focus on what the Rockets did to set up the Harrell signing and how Houston will attempt to navigate the hard cap this season. Before signing Harrell, the Rockets needed to make a few moves to create a sufficient amount of room below the resulting hard cap. This helps explain why Houston and Chuck Hayes decided not to proceed with a partially-guaranteed veteran’s minimum deal. It may also explain why the Philadelphia 76ers ended up signing Christian Wood, who had previously agreed to a partially-guaranteed deal with the Rockets after going undrafted in the 2015 NBA Draft. With Hayes and Wood on the Rockets’ books, it would have been difficult to give Harrell the deal he wanted. Regular player contracts, even non-guaranteed contracts, still protect players from injuries suffered while playing for their teams. A player signed to a (regular) non-guaranteed contract who gets injured in training camp continues to count against his team’s cap until he returns from injury. An extended injury to such a player could have potentially disastrous consequences for a team right up against a hard cap. By contrast, player contracts containing an Exhibit 9 (while still providing players with a per diem, lodging expenses and medical insurance) limit a player’s compensation to $6,000 if he gets injured. However, in order for a team to sign players to Exhibit 9 contracts, it must have at least 14 regular contracts on its books. But with Harrell unsigned, the Rockets only had 13 contracts once they re-signed Jason Terry. This is where Daryl Morey and his staff got a little creative. Even hard-capped, the Rockets should still have room to add to the roster beyond just “Exhibit 9 guys.” However, expect Morey & company to be more judicious in their signings than in years past. 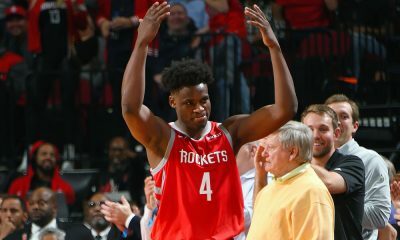 The Rockets can sign a player to the veteran’s minimum, either now (for the full two-year veteran’s minimum amount) or later in the season (during which that amount prorates downward based on the number of days remaining in the regular season). Houston still has about $1.27 million left of its Non-Taxpayer MLE it can use. Unlike the veteran’s minimum salary, the MLE does not begin to prorate downward until January 10, making the MLE an even more attractive alternative to the minimum after the trade deadline, when several key older veterans negotiate buyouts with their former teams in hopes of latching on with a contender. The Rockets also have a few small trade exceptions (described in my last cap update) they could use to claim a player off waivers. 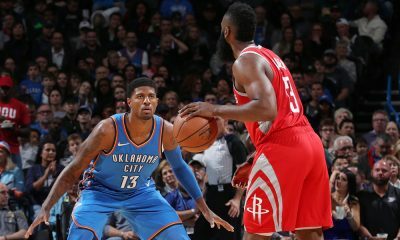 With 14 guaranteed contracts spread fairly evenly across all five positions, don’t expect the Rockets to be eager to sign another player to a guaranteed deal. They will probably bide their time and see if a good enough player “shakes loose” in free agency. Trades are where the hard cap may have its most profound impact on the Rockets. Even before the hard cap was imposed, Houston was subject to the more restrictive salary-matching rules for taxpaying teams, which limit incoming salary to 125% (plus $100,000) of outgoing salary. The hard cap adds another layer of restrictions on top of that. For instance, let’s say the Rockets have the opportunity to trade three players in exchange for one significant player. 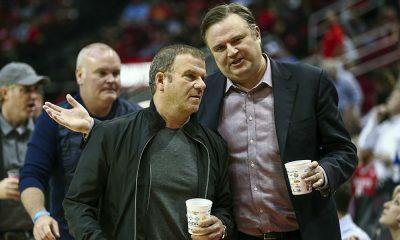 Even if such a trade would work under salary-matching rules, the Rockets would still need to fill out their roster to meet the league’s minimum roster requirement of 13 players. Even signing 1-2 players to veteran’s minimum salaries could push the team above the apron level and could therefore make the trade illegal. 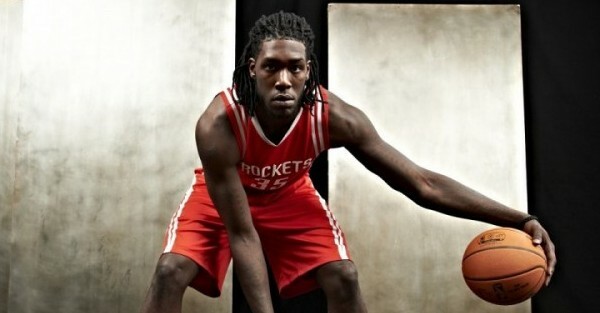 The signing of Harrell has created a hard cap for the Rockets. While this hard cap has already cost Houston guys like Hayes and Wood, it does not completely cut off any ongoing salary cap flexibility. Trades and signings can still be made, albeit to a limited extent. Meanwhile, Houston has locked up a first round-caliber talent to a long-term deal that will likely be a bargain in as little as one year. This was apparently a trade-off that Morey and his staff felt was worth making.